Last year, my husband and I were honored to become godparents for the first time. Our dear friends had just become parents for a seventh time, adopting an African American boy they named Trae. 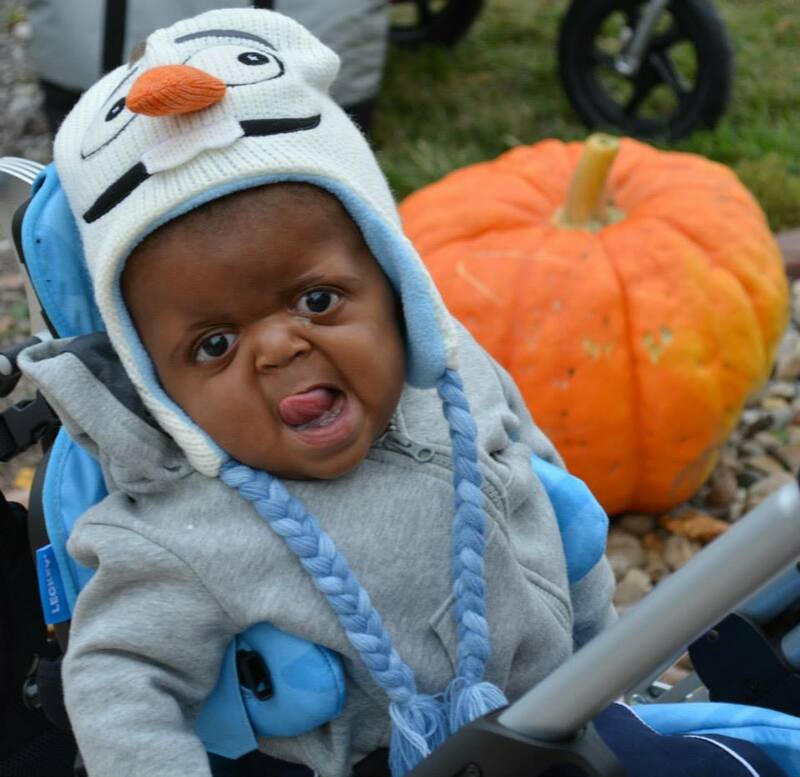 Trae was born prematurely with a diagnosis of Apert syndrome, a condition in which the child’s skull bones prematurely fuse, causing some of the child’s facial features much more prominent or receded. Additionally, children with Apert syndrome can have fused toes and fingers, are prone to deafness, seizures, and cleft palate, and can develop more slowly than their peers. Trae utilizes a special stroller and high chair, each designed to accommodate his physical needs. He receives multiple therapy sessions every week, and he will experience several risky surgeries throughout his early life, including skull surgeries. Trae is a social little boy whose smile can light up a room. He is 20 months old and has recently mastered saying “dada” and sitting up on his own. He’s learning baby sign language and is teething like a typical toddler. Despite his many wonderful qualities, the baby garners many stares and rude comments. One of the medical professionals he recently met with remarked how he looked like a “pug.” Some children ask their parents, quite loudly, “What is wrong with that boy?” Others simply stare. These are not rare occurrences. The family encounters unsolicited looks and comments at restaurants, airports, stores, and even among doctors and nurses at some of Trae’s many medical appointments. Recently, Trae and his mom were at a store, when a boy, about 6 years old, told his mom, “That baby looks weird!” His mom immediately and loudly shushed him. Trae’s mom was livid, partly because she was fed up with the constant slew of stares and loud comments about her son, but also because the boy’s mom did the exact opposite of what she should have. She silenced and shamed her child instead responding effectively and compassionately. Certainly, many of us have been there. We are going about our business when our child notices someone different: the woman with the large backside, the man in the wheelchair who is missing a leg, the child with Down syndrome. Our natural instinct is to shut down the situation as quickly as possible, but doing so sends a powerful message to our children. 3. Don’t interrogate. There is no reason to ask what is “wrong” with a child or demand an explanation of the child’s condition or the family dynamic. If a parent wishes to share information about his or her child or family, that is their choice. If the child wishes to share, depending on the age and level of maturity and development, that is the child’s choice. 4. Treat the child like a person, because he or she is a person. Smile, offer a compliment, and make small talk. This is how friendships are formed. 5. Follow up with your child privately. Talk to your child about the appropriate way to respond to someone new. This might mean an immediate introduction, offering to share a toy or play together, or even something as simple as a smile or a high-five. Remind your child that it’s okay to notice difference, but questions and comments should be reserved for private, family conversations at a later time. You may not have all the right words to explain a situation, but remember that by being open and honest with your child, you are conditioning your child to know that he or she can come to you about any topic and be received with open arms and heart. 6. Use any mishaps as teachable moments, for both you and your child. Children will be children. They will say things they shouldn’t. If you don’t handle a situation well in the moment, admit that to your child and discuss what should be done differently in the future. If you do shush your child, apologize for doing so. And if your child, despite your preparations, responds to a situation inappropriately, talk about how it can be better handled in the future. 7. Evaluate your own relationships. How diverse is your circle of friends? Do you welcome others who are different from you? Do you have true friendships with others who don’t share your race, religion, age, or ability? If your child were to look at you and your friends, would they see same-ness or acceptance of difference? You cannot expect your child not to be intrigued by someone who looks different when the child is only around those who look and interact just like him or her. Children are naturally curious and excited when they discover something or someone new. As parents, our job is to demonstrate to our children what empathy, compassion, friendship, and diversity looks like. Shushing is shame-inducing, not inclusion-promoting. Next time, smile, say hello and give friendships a chance to form. The Mighty is asking the following: Can you describe the moment someone changed the way you think about a disability or disease? If you’d like to participate, please send a blog post to [email protected]ghty.com. Please include a photo for the piece, a photo of yourself and 1-2 sentence bio. Rachel Garlinghouse is the author of three books, including “Come Rain or Come Shine: A White Parent’s Guide to Adopting and Parenting Black Children.” Her work has appeared on Huffington Post, MSNBC, NPR, Huffington Post Live, Scary Mommy and Babble, among others. She lives in St. Louis with her husband and three children. Learn more at www.whitesugarbrownsugar.com.